This article is about the star. For other uses, see Sun (disambiguation). "The sun" redirects here. For other uses, see The Sun (disambiguation). The Sun is the star at the center of the Solar System. It is a nearly perfect sphere of hot plasma, with internal convective motion that generates a magnetic field via a dynamo process. It is by far the most important source of energy for life on Earth. Its diameter is about 1.39 million kilometers (864,000 miles), or 109 times that of Earth, and its mass is about 330,000 times that of Earth. It accounts for about 99.86% of the total mass of the Solar System. Roughly three quarters of the Sun's mass consists of hydrogen (~73%); the rest is mostly helium (~25%), with much smaller quantities of heavier elements, including oxygen, carbon, neon, and iron. Sun with sunspots and limb darkening as seen in visible light with solar filter. The Sun is a G-type main-sequence star (G2V) based on its spectral class. As such, it is informally and not completely accurately referred to as a yellow dwarf (its light is closer to white than yellow). It formed approximately 4.6 billion[a] years ago from the gravitational collapse of matter within a region of a large molecular cloud. Most of this matter gathered in the center, whereas the rest flattened into an orbiting disk that became the Solar System. The central mass became so hot and dense that it eventually initiated nuclear fusion in its core. It is thought that almost all stars form by this process. The Sun is roughly middle-aged; it has not changed dramatically for more than four billion[a] years, and will remain fairly stable for more than another five billion years. It currently fuses about 600 million tons of hydrogen into helium every second, converting 4 million tons of matter into energy every second as a result. This energy, which can take between 10,000 and 170,000 years to escape from its core, is the source of the Sun's light and heat. In about 5 billion years, when hydrogen fusion in its core has diminished to the point at which the Sun is no longer in hydrostatic equilibrium, its core will undergo a marked increase in density and temperature while its outer layers expand to eventually become a red giant. It is calculated that the Sun will become sufficiently large to engulf the current orbits of Mercury and Venus, and render Earth uninhabitable. After this, it will shed its outer layers and become a dense type of cooling star known as a white dwarf, and no longer produce energy by fusion, but still glow and give off heat from its previous fusion. The English proper name Sun developed from Old English sunne and may be related to south. Cognates to English sun appear in other Germanic languages, including Old Frisian sunne, sonne, Old Saxon sunna, Middle Dutch sonne, modern Dutch zon, Old High German sunna, modern German Sonne, Old Norse sunna, and Gothic sunnō. All Germanic terms for the Sun stem from Proto-Germanic *sunnōn. 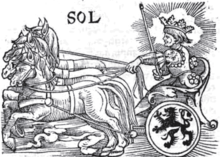 The Latin name for the Sun, Sol, is not commonly used in everyday English. Sol is also used by planetary astronomers to refer to the duration of a solar day on another planet, such as Mars. The related word solar is the usual adjectival term used for the Sun, in terms such as solar day, solar eclipse, and Solar System. A mean Earth solar day is approximately 24 hours, whereas a mean Martian 'sol' is 24 hours, 39 minutes, and 35.244 seconds. 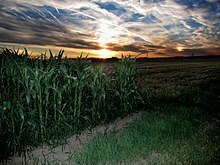 The English weekday name Sunday stems from Old English (Sunnandæg; "Sun's day", from before 700) and is ultimately a result of a Germanic interpretation of Latin dies solis, itself a translation of the Greek ἡμέρα ἡλίου (hēméra hēlíou). The Sun is a G-type main-sequence star that comprises about 99.86% of the mass of the Solar System. The Sun has an absolute magnitude of +4.83, estimated to be brighter than about 85% of the stars in the Milky Way, most of which are red dwarfs. The Sun is a Population I, or heavy-element-rich,[b] star. The formation of the Sun may have been triggered by shockwaves from one or more nearby supernovae. This is suggested by a high abundance of heavy elements in the Solar System, such as gold and uranium, relative to the abundances of these elements in so-called Population II, heavy-element-poor, stars. The heavy elements could most plausibly have been produced by endothermic nuclear reactions during a supernova, or by transmutation through neutron absorption within a massive second-generation star. The Sun is by far the brightest object in the Earth's sky, with an apparent magnitude of −26.74. This is about 13 billion times brighter than the next brightest star, Sirius, which has an apparent magnitude of −1.46. The mean distance of the Sun's center to Earth's center is approximately 1 astronomical unit (about 150,000,000 km; 93,000,000 mi), though the distance varies as Earth moves from perihelion in January to aphelion in July. At this average distance, light travels from the Sun's horizon to Earth's horizon in about 8 minutes and 19 seconds, while light from the closest points of the Sun and Earth takes about two seconds less. The energy of this sunlight supports almost all life[c] on Earth by photosynthesis, and drives Earth's climate and weather. The Sun does not have a definite boundary, but its density decreases exponentially with increasing height above the photosphere. For the purpose of measurement, however, the Sun's radius is considered to be the distance from its center to the edge of the photosphere, the apparent visible surface of the Sun. By this measure, the Sun is a near-perfect sphere with an oblateness estimated at about 9 millionths, which means that its polar diameter differs from its equatorial diameter by only 10 kilometres (6.2 mi). The tidal effect of the planets is weak and does not significantly affect the shape of the Sun. The Sun rotates faster at its equator than at its poles. This differential rotation is caused by convective motion due to heat transport and the Coriolis force due to the Sun's rotation. In a frame of reference defined by the stars, the rotational period is approximately 25.6 days at the equator and 33.5 days at the poles. Viewed from Earth as it orbits the Sun, the apparent rotational period of the Sun at its equator is about 28 days. The solar constant is the amount of power that the Sun deposits per unit area that is directly exposed to sunlight. The solar constant is equal to approximately 7003136800000000000♠1,368 W/m2 (watts per square meter) at a distance of one astronomical unit (AU) from the Sun (that is, on or near Earth). Sunlight on the surface of Earth is attenuated by Earth's atmosphere, so that less power arrives at the surface (closer to 7003100000000000000♠1,000 W/m2) in clear conditions when the Sun is near the zenith. Sunlight at the top of Earth's atmosphere is composed (by total energy) of about 50% infrared light, 40% visible light, and 10% ultraviolet light. The atmosphere in particular filters out over 70% of solar ultraviolet, especially at the shorter wavelengths. Solar ultraviolet radiation ionizes Earth's dayside upper atmosphere, creating the electrically conducting ionosphere. The Sun's color is white, with a CIE color-space index near (0.3, 0.3), when viewed from space or when the Sun is high in the sky. When measuring all the photons emitted, the Sun is actually emitting more photons in the green portion of the spectrum than any other. When the Sun is low in the sky, atmospheric scattering renders the Sun yellow, red, orange, or magenta. Despite its typical whiteness, most people mentally picture the Sun as yellow; the reasons for this are the subject of debate. The Sun is a G2V star, with G2 indicating its surface temperature of approximately 5,778 K (5,505 °C, 9,941 °F), and V that it, like most stars, is a main-sequence star. The average luminance of the Sun is about 1.88 giga candela per square metre, but as viewed through Earth's atmosphere, this is lowered to about 1.44 Gcd/m2. [d] However, the luminance is not constant across the disk of the Sun (limb darkening). The Sun is composed primarily of the chemical elements hydrogen and helium. At this time in the Sun's life, they account for 74.9% and 23.8% of the mass of the Sun in the photosphere, respectively. All heavier elements, called metals in astronomy, account for less than 2% of the mass, with oxygen (roughly 1% of the Sun's mass), carbon (0.3%), neon (0.2%), and iron (0.2%) being the most abundant. The Sun's original chemical composition was inherited from the interstellar medium out of which it formed. Originally it would have contained about 71.1% hydrogen, 27.4% helium, and 1.5% heavier elements. The hydrogen and most of the helium in the Sun would have been produced by Big Bang nucleosynthesis in the first 20 minutes of the universe, and the heavier elements were produced by previous generations of stars before the Sun was formed, and spread into the interstellar medium during the final stages of stellar life and by events such as supernovae. Since the Sun formed, the main fusion process has involved fusing hydrogen into helium. Over the past 4.6 billion years, the amount of helium and its location within the Sun has gradually changed. Within the core, the proportion of helium has increased from about 24% to about 60% due to fusion, and some of the helium and heavy elements have settled from the photosphere towards the center of the Sun because of gravity. The proportions of metals (heavier elements) is unchanged. Heat is transferred outward from the Sun's core by radiation rather than by convection (see Radiative zone below), so the fusion products are not lifted outward by heat; they remain in the core and gradually an inner core of helium has begun to form that cannot be fused because presently the Sun's core is not hot or dense enough to fuse helium. In the current photosphere the helium fraction is reduced, and the metallicity is only 84% of what it was in the protostellar phase (before nuclear fusion in the core started). In the future, helium will continue to accumulate in the core, and in about 5 billion years this gradual build-up will eventually cause the Sun to exit the main sequence and become a red giant. The chemical composition of the photosphere is normally considered representative of the composition of the primordial Solar System. The solar heavy-element abundances described above are typically measured both using spectroscopy of the Sun's photosphere and by measuring abundances in meteorites that have never been heated to melting temperatures. These meteorites are thought to retain the composition of the protostellar Sun and are thus not affected by settling of heavy elements. The two methods generally agree well. In the 1970s, much research focused on the abundances of iron-group elements in the Sun. Although significant research was done, until 1978 it was difficult to determine the abundances of some iron-group elements (e.g. cobalt and manganese) via spectrography because of their hyperfine structures. The first largely complete set of oscillator strengths of singly ionized iron-group elements were made available in the 1960s, and these were subsequently improved. In 1978, the abundances of singly ionized elements of the iron group were derived. Various authors have considered the existence of a gradient in the isotopic compositions of solar and planetary noble gases, e.g. correlations between isotopic compositions of neon and xenon in the Sun and on the planets. Prior to 1983, it was thought that the whole Sun has the same composition as the solar atmosphere. In 1983, it was claimed that it was fractionation in the Sun itself that caused the isotopic-composition relationship between the planetary and solar-wind-implanted noble gases. Core – the innermost 20-25% of the Sun's radius, where temperature (energies) and pressure are sufficient for nuclear fusion to occur. Hydrogen fuses into helium (which cannot currently be fused at this point in the Sun's life). The fusion process releases energy, and the helium gradually accumulates to form an inner core of helium within the core itself. Radiative zone – Convection cannot occur until much nearer the surface of the Sun. Therefore, between about 20-25% of the radius, and 70% of the radius, there is a "radiative zone" in which energy transfer occurs by means of radiation (photons) rather than by convection. Tachocline – the boundary region between the radiative and convective zones. Convective zone – Between about 70% of the Sun's radius and a point close to the visible surface, the Sun is cool and diffuse enough for convection to occur, and this becomes the primary means of outward heat transfer, similar to weather cells which form in the earth's atmosphere. Photosphere – the deepest part of the Sun which we can directly observe with visible light. Because the Sun is a gaseous object, it does not have a clearly-defined surface; its visible parts are usually divided into a 'photosphere' and 'atmosphere'. Atmosphere – a gaseous 'halo' surrounding the Sun, comprising the chromosphere, solar transition region, corona and heliosphere. These can be seen when the main part of the Sun is hidden, for example, during a solar eclipse. The core of the Sun extends from the center to about 20–25% of the solar radius. It has a density of up to 7005150000000000000♠150 g/cm3 (about 150 times the density of water) and a temperature of close to 15.7 million kelvins (K). By contrast, the Sun's surface temperature is approximately 5,800 K. Recent analysis of SOHO mission data favors a faster rotation rate in the core than in the radiative zone above. Through most of the Sun's life, energy has been produced by nuclear fusion in the core region through a series of steps called the p–p (proton–proton) chain; this process converts hydrogen into helium. Only 0.8% of the energy generated in the Sun comes from the CNO cycle, though this proportion is expected to increase as the Sun becomes older. 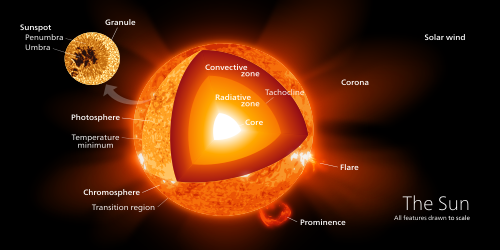 The core is the only region in the Sun that produces an appreciable amount of thermal energy through fusion; 99% of the power is generated within 24% of the Sun's radius, and by 30% of the radius, fusion has stopped nearly entirely. The remainder of the Sun is heated by this energy as it is transferred outwards through many successive layers, finally to the solar photosphere where it escapes into space as sunlight or the kinetic energy of particles. The fusion rate in the core is in a self-correcting equilibrium: a slightly higher rate of fusion would cause the core to heat up more and expand slightly against the weight of the outer layers, reducing the density and hence the fusion rate and correcting the perturbation; and a slightly lower rate would cause the core to cool and shrink slightly, increasing the density and increasing the fusion rate and again reverting it to its present rate. From the core out to about 0.7 solar radii, thermal radiation is the primary means of energy transfer. The temperature drops from approximately 7 million to 2 million kelvins with increasing distance from the core. This temperature gradient is less than the value of the adiabatic lapse rate and hence cannot drive convection, which explains why the transfer of energy through this zone is by radiation instead of thermal convection. Ions of hydrogen and helium emit photons, which travel only a brief distance before being reabsorbed by other ions. The density drops a hundredfold (from 20 g/cm3 to 0.2 g/cm3) from 0.25 solar radii to the 0.7 radii, the top of the radiative zone. The radiative zone and the convective zone are separated by a transition layer, the tachocline. This is a region where the sharp regime change between the uniform rotation of the radiative zone and the differential rotation of the convection zone results in a large shear between the two—a condition where successive horizontal layers slide past one another. 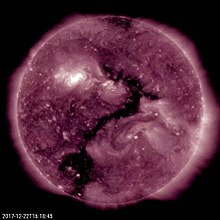 Presently, it is hypothesized (see Solar dynamo) that a magnetic dynamo within this layer generates the Sun's magnetic field. The Sun's convection zone extends from 0.7 solar radii (500,000 km) to near the surface. In this layer, the solar plasma is not dense enough or hot enough to transfer the heat energy of the interior outward via radiation. Instead, the density of the plasma is low enough to allow convective currents to develop and move the Sun's energy outward towards its surface. Material heated at the tachocline picks up heat and expands, thereby reducing its density and allowing it to rise. As a result, an orderly motion of the mass develops into thermal cells that carry the majority of the heat outward to the Sun's photosphere above. Once the material diffusively and radiatively cools just beneath the photospheric surface, its density increases, and it sinks to the base of the convection zone, where it again picks up heat from the top of the radiative zone and the convective cycle continues. At the photosphere, the temperature has dropped to 5,700 K and the density to only 0.2 g/m3 (about 1/6,000 the density of air at sea level). The thermal columns of the convection zone form an imprint on the surface of the Sun giving it a granular appearance called the solar granulation at the smallest scale and supergranulation at larger scales. Turbulent convection in this outer part of the solar interior sustains "small-scale" dynamo action over the near-surface volume of the Sun. The Sun's thermal columns are Bénard cells and take the shape of hexagonal prisms. The effective temperature, or black body temperature, of the Sun (5,777 K) is the temperature a black body of the same size must have to yield the same total emissive power. The visible surface of the Sun, the photosphere, is the layer below which the Sun becomes opaque to visible light. Above the photosphere visible sunlight is free to propagate into space, and almost all of its energy escapes the Sun entirely. The change in opacity is due to the decreasing amount of H− ions, which absorb visible light easily. Conversely, the visible light we see is produced as electrons react with hydrogen atoms to produce H− ions. The photosphere is tens to hundreds of kilometers thick, and is slightly less opaque than air on Earth. Because the upper part of the photosphere is cooler than the lower part, an image of the Sun appears brighter in the center than on the edge or limb of the solar disk, in a phenomenon known as limb darkening. The spectrum of sunlight has approximately the spectrum of a black-body radiating at 5,777 K, interspersed with atomic absorption lines from the tenuous layers above the photosphere. The photosphere has a particle density of ~1023 m−3 (about 0.37% of the particle number per volume of Earth's atmosphere at sea level). The photosphere is not fully ionized—the extent of ionization is about 3%, leaving almost all of the hydrogen in atomic form. During early studies of the optical spectrum of the photosphere, some absorption lines were found that did not correspond to any chemical elements then known on Earth. In 1868, Norman Lockyer hypothesized that these absorption lines were caused by a new element that he dubbed helium, after the Greek Sun god Helios. Twenty-five years later, helium was isolated on Earth. During a total solar eclipse, when the disk of the Sun is covered by that of the Moon, parts of the Sun's surrounding atmosphere can be seen. It is composed of four distinct parts: the chromosphere, the transition region, the corona and the heliosphere. 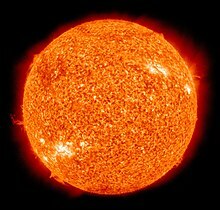 The coolest layer of the Sun is a temperature minimum region extending to about 7005500000000000000♠500 km above the photosphere, and has a temperature of about 7003410000000000000♠4,100 K. This part of the Sun is cool enough to allow the existence of simple molecules such as carbon monoxide and water, which can be detected via their absorption spectra. The chromosphere, transition region, and corona are much hotter than the surface of the Sun. The reason is not well understood, but evidence suggests that Alfvén waves may have enough energy to heat the corona. Above the temperature minimum layer is a layer about 7006200000000000000♠2,000 km thick, dominated by a spectrum of emission and absorption lines. It is called the chromosphere from the Greek root chroma, meaning color, because the chromosphere is visible as a colored flash at the beginning and end of total solar eclipses. The temperature of the chromosphere increases gradually with altitude, ranging up to around 7004200000000000000♠20,000 K near the top. In the upper part of the chromosphere helium becomes partially ionized. The corona is the next layer of the Sun. The low corona, near the surface of the Sun, has a particle density around 1015 m−3 to 1016 m−3. [f] The average temperature of the corona and solar wind is about 1,000,000–2,000,000 K; however, in the hottest regions it is 8,000,000–20,000,000 K. Although no complete theory yet exists to account for the temperature of the corona, at least some of its heat is known to be from magnetic reconnection. The corona is the extended atmosphere of the Sun, which has a volume much larger than the volume enclosed by the Sun's photosphere. A flow of plasma outward from the Sun into interplanetary space is the solar wind. The heliosphere, the tenuous outermost atmosphere of the Sun, is filled with the solar wind plasma. This outermost layer of the Sun is defined to begin at the distance where the flow of the solar wind becomes superalfvénic—that is, where the flow becomes faster than the speed of Alfvén waves, at approximately 20 solar radii (0.1 AU). Turbulence and dynamic forces in the heliosphere cannot affect the shape of the solar corona within, because the information can only travel at the speed of Alfvén waves. The solar wind travels outward continuously through the heliosphere, forming the solar magnetic field into a spiral shape, until it impacts the heliopause more than 50 AU from the Sun. In December 2004, the Voyager 1 probe passed through a shock front that is thought to be part of the heliopause. In late 2012 Voyager 1 recorded a marked increase in cosmic ray collisions and a sharp drop in lower energy particles from the solar wind, which suggested that the probe had passed through the heliopause and entered the interstellar medium. High-energy gamma-ray photons initially released with fusion reactions in the core are almost immediately absorbed by the solar plasma of the radiative zone, usually after traveling only a few millimeters. Re-emission happens in a random direction and usually at a slightly lower energy. With this sequence of emissions and absorptions, it takes a long time for radiation to reach the Sun's surface. Estimates of the photon travel time range between 10,000 and 170,000 years. In contrast, it takes only 2.3 seconds for the neutrinos, which account for about 2% of the total energy production of the Sun, to reach the surface. Because energy transport in the Sun is a process that involves photons in thermodynamic equilibrium with matter, the time scale of energy transport in the Sun is longer, on the order of 30,000,000 years. This is the time it would take the Sun to return to a stable state, if the rate of energy generation in its core were suddenly changed. Neutrinos are also released by the fusion reactions in the core, but, unlike photons, they rarely interact with matter, so almost all are able to escape the Sun immediately. For many years measurements of the number of neutrinos produced in the Sun were lower than theories predicted by a factor of 3. This discrepancy was resolved in 2001 through the discovery of the effects of neutrino oscillation: the Sun emits the number of neutrinos predicted by the theory, but neutrino detectors were missing ​2⁄3 of them because the neutrinos had changed flavor by the time they were detected. Butterfly diagram showing paired sunspot pattern. Graph is of sunspot area. The Sun has a magnetic field that varies across the surface of the Sun. Its polar field is 1–2 gauss (0.0001–0.0002 T), whereas the field is typically 3,000 gauss (0.3 T) in features on the Sun called sunspots and 10–100 gauss (0.001–0.01 T) in solar prominences. The magnetic field also varies in time and location. The quasi-periodic 11-year solar cycle is the most prominent variation in which the number and size of sunspots waxes and wanes. Sunspots are visible as dark patches on the Sun's photosphere, and correspond to concentrations of magnetic field where the convective transport of heat is inhibited from the solar interior to the surface. As a result, sunspots are slightly cooler than the surrounding photosphere, and, so, they appear dark. At a typical solar minimum, few sunspots are visible, and occasionally none can be seen at all. Those that do appear are at high solar latitudes. As the solar cycle progresses towards its maximum, sunspots tend form closer to the solar equator, a phenomenon known as Spörer's law. The largest sunspots can be tens of thousands of kilometers across. An 11-year sunspot cycle is half of a 22-year Babcock–Leighton dynamo cycle, which corresponds to an oscillatory exchange of energy between toroidal and poloidal solar magnetic fields. At solar-cycle maximum, the external poloidal dipolar magnetic field is near its dynamo-cycle minimum strength, but an internal toroidal quadrupolar field, generated through differential rotation within the tachocline, is near its maximum strength. At this point in the dynamo cycle, buoyant upwelling within the convective zone forces emergence of toroidal magnetic field through the photosphere, giving rise to pairs of sunspots, roughly aligned east–west and having footprints with opposite magnetic polarities. The magnetic polarity of sunspot pairs alternates every solar cycle, a phenomenon known as the Hale cycle. During the solar cycle's declining phase, energy shifts from the internal toroidal magnetic field to the external poloidal field, and sunspots diminish in number and size. At solar-cycle minimum, the toroidal field is, correspondingly, at minimum strength, sunspots are relatively rare, and the poloidal field is at its maximum strength. With the rise of the next 11-year sunspot cycle, differential rotation shifts magnetic energy back from the poloidal to the toroidal field, but with a polarity that is opposite to the previous cycle. The process carries on continuously, and in an idealized, simplified scenario, each 11-year sunspot cycle corresponds to a change, then, in the overall polarity of the Sun's large-scale magnetic field. The solar magnetic field extends well beyond the Sun itself. The electrically conducting solar wind plasma carries the Sun's magnetic field into space, forming what is called the interplanetary magnetic field. In an approximation known as ideal magnetohydrodynamics, plasma particles only move along the magnetic field lines. As a result, the outward-flowing solar wind stretches the interplanetary magnetic field outward, forcing it into a roughly radial structure. For a simple dipolar solar magnetic field, with opposite hemispherical polarities on either side of the solar magnetic equator, a thin current sheet is formed in the solar wind. At great distances, the rotation of the Sun twists the dipolar magnetic field and corresponding current sheet into an Archimedean spiral structure called the Parker spiral. The interplanetary magnetic field is much stronger than the dipole component of the solar magnetic field. The Sun's dipole magnetic field of 50–400 μT (at the photosphere) reduces with the inverse-cube of the distance to about 0.1 nT at the distance of Earth. However, according to spacecraft observations the interplanetary field at Earth's location is around 5 nT, about a hundred times greater. The difference is due to magnetic fields generated by electrical currents in the plasma surrounding the Sun. The Sun's magnetic field leads to many effects that are collectively called solar activity. Solar flares and coronal-mass ejections tend to occur at sunspot groups. Slowly changing high-speed streams of solar wind are emitted from coronal holes at the photospheric surface. Both coronal-mass ejections and high-speed streams of solar wind carry plasma and interplanetary magnetic field outward into the Solar System. The effects of solar activity on Earth include auroras at moderate to high latitudes and the disruption of radio communications and electric power. Solar activity is thought to have played a large role in the formation and evolution of the Solar System. With solar-cycle modulation of sunspot number comes a corresponding modulation of space weather conditions, including those surrounding Earth where technological systems can be affected. Long-term secular change in sunspot number is thought, by some scientists, to be correlated with long-term change in solar irradiance, which, in turn, might influence Earth's long-term climate. For example, in the 17th century, the solar cycle appeared to have stopped entirely for several decades; few sunspots were observed during a period known as the Maunder minimum. This coincided in time with the era of the Little Ice Age, when Europe experienced unusually cold temperatures. Earlier extended minima have been discovered through analysis of tree rings and appear to have coincided with lower-than-average global temperatures. The Sun today is roughly halfway through the most stable part of its life. It has not changed dramatically for over four billion[a] years, and will remain fairly stable for more than five billion more. However, after hydrogen fusion in its core has stopped, the Sun will undergo dramatic changes, both internally and externally. The Sun formed about 4.6 billion years ago from the collapse of part of a giant molecular cloud that consisted mostly of hydrogen and helium and that probably gave birth to many other stars. This age is estimated using computer models of stellar evolution and through nucleocosmochronology. The result is consistent with the radiometric date of the oldest Solar System material, at 4.567 billion years ago. Studies of ancient meteorites reveal traces of stable daughter nuclei of short-lived isotopes, such as iron-60, that form only in exploding, short-lived stars. This indicates that one or more supernovae must have occurred near the location where the Sun formed. A shock wave from a nearby supernova would have triggered the formation of the Sun by compressing the matter within the molecular cloud and causing certain regions to collapse under their own gravity. As one fragment of the cloud collapsed it also began to rotate because of conservation of angular momentum and heat up with the increasing pressure. Much of the mass became concentrated in the center, whereas the rest flattened out into a disk that would become the planets and other Solar System bodies. Gravity and pressure within the core of the cloud generated a lot of heat as it accreted more matter from the surrounding disk, eventually triggering nuclear fusion. HD 162826 and HD 186302 are hypothesized stellar siblings of the Sun, having formed in the same molecular cloud. The Sun is about halfway through its main-sequence stage, during which nuclear fusion reactions in its core fuse hydrogen into helium. Each second, more than four million tonnes of matter are converted into energy within the Sun's core, producing neutrinos and solar radiation. At this rate, the Sun has so far converted around 100 times the mass of Earth into energy, about 0.03% of the total mass of the Sun. The Sun will spend a total of approximately 10 billion years as a main-sequence star. The Sun is gradually becoming hotter during its time on the main sequence, because the helium atoms in the core occupy less volume than the hydrogen atoms that were fused. The core is therefore shrinking, allowing the outer layers of the Sun to move closer to the centre and experience a stronger gravitational force, according to the inverse-square law. This stronger force increases the pressure on the core, which is resisted by a gradual increase in the rate at which fusion occurs. This process speeds up as the core gradually becomes denser. It is estimated that the Sun has become 30% brighter in the last 4.5 billion years. At present, it is increasing in brightness by about 1% every 100 million years. The Sun does not have enough mass to explode as a supernova. Instead it will exit the main sequence in approximately 5 billion years and start to turn into a red giant. As a red giant, the Sun will grow so large that it will engulf Mercury, Venus, and probably Earth. Even before it becomes a red giant, the luminosity of the Sun will have nearly doubled, and Earth will receive as much sunlight as Venus receives today. Once the core hydrogen is exhausted in 5.4 billion years, the Sun will expand into a subgiant phase and slowly double in size over about half a billion years. It will then expand more rapidly over about half a billion years until it is over two hundred times larger than today and a couple of thousand times more luminous. This then starts the red-giant-branch phase where the Sun will spend around a billion years and lose around a third of its mass. Evolution of a Sun-like star. The track of a one solar mass star on the Hertzsprung–Russell diagram is shown from the main sequence to the post-asymptotic-giant-branch stage. After the red-giant branch the Sun has approximately 120 million years of active life left, but much happens. First, the core, full of degenerate helium ignites violently in the helium flash, where it is estimated that 6% of the core, itself 40% of the Sun's mass, will be converted into carbon within a matter of minutes through the triple-alpha process. The Sun then shrinks to around 10 times its current size and 50 times the luminosity, with a temperature a little lower than today. It will then have reached the red clump or horizontal branch, but a star of the Sun's mass does not evolve blueward along the horizontal branch. Instead, it just becomes moderately larger and more luminous over about 100 million years as it continues to burn helium in the core. When the helium is exhausted, the Sun will repeat the expansion it followed when the hydrogen in the core was exhausted, except that this time it all happens faster, and the Sun becomes larger and more luminous. This is the asymptotic-giant-branch phase, and the Sun is alternately burning hydrogen in a shell or helium in a deeper shell. After about 20 million years on the early asymptotic giant branch, the Sun becomes increasingly unstable, with rapid mass loss and thermal pulses that increase the size and luminosity for a few hundred years every 100,000 years or so. The thermal pulses become larger each time, with the later pulses pushing the luminosity to as much as 5,000 times the current level and the radius to over 1 AU. According to a 2008 model, Earth's orbit is shrinking due to tidal forces (and, eventually, drag from the lower chromosphere), so that it will be engulfed by the Sun near the tip of the red giant branch phase, 3.8 and 1 million years after Mercury and Venus have respectively suffered the same fate. Models vary depending on the rate and timing of mass loss. Models that have higher mass loss on the red-giant branch produce smaller, less luminous stars at the tip of the asymptotic giant branch, perhaps only 2,000 times the luminosity and less than 200 times the radius. For the Sun, four thermal pulses are predicted before it completely loses its outer envelope and starts to make a planetary nebula. By the end of that phase—lasting approximately 500,000 years—the Sun will only have about half of its current mass. The post-asymptotic-giant-branch evolution is even faster. The luminosity stays approximately constant as the temperature increases, with the ejected half of the Sun's mass becoming ionised into a planetary nebula as the exposed core reaches 30,000 K. The final naked core, a white dwarf, will have a temperature of over 100,000 K, and contain an estimated 54.05% of the Sun's present day mass. The planetary nebula will disperse in about 10,000 years, but the white dwarf will survive for trillions of years before fading to a hypothetical black dwarf. The Sun lies close to the inner rim of the Milky Way's Orion Arm, in the Local Interstellar Cloud or the Gould Belt, at a distance of 7.5–8.5 kpc (25,000–28,000 light-years) from the Galactic Center. The Sun is contained within the Local Bubble, a space of rarefied hot gas, possibly produced by the supernova remnant Geminga, or multiple supernovae in subgroup B1 of the Pleiades moving group. The distance between the local arm and the next arm out, the Perseus Arm, is about 6,500 light-years. The Sun, and thus the Solar System, is found in what scientists call the galactic habitable zone. The Apex of the Sun's Way, or the solar apex, is the direction that the Sun travels relative to other nearby stars. This motion is towards a point in the constellation Hercules, near the star Vega. Within 32.6 ly of the Sun there are 315 known stars in 227 systems, as of 2000, including 163 single stars. It is estimated that a further 130 systems within this range have not yet been identified. Out to 81.5 ly, there may be up to 7,500 stars, of which around 2,600 are known. The number of substellar objects in that volume are expected to be comparable to the number of stars. Of the 50 nearest stellar systems within 17 light-years from Earth (the closest being the red dwarf Proxima Centauri at approximately 4.2 light-years), the Sun ranks fourth in mass. have take the same amount of time to go around the galaxy as the sun and thus remain in the same general vicinity as the Sun. 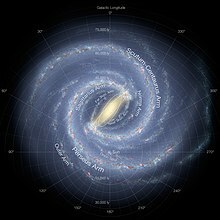 The Sun's orbit around the Milky Way is perturbed due to the non-uniform mass distribution in Milky Way, such as that in and between the galactic spiral arms. It has been argued that the Sun's passage through the higher density spiral arms often coincides with mass extinctions on Earth, perhaps due to increased impact events. It takes the Solar System about 225–250 million years to complete one orbit through the Milky Way (a galactic year), so it is thought to have completed 20–25 orbits during the lifetime of the Sun. The orbital speed of the Solar System about the center of the Milky Way is approximately 251 km/s (156 mi/s). At this speed, it takes around 1,190 years for the Solar System to travel a distance of 1 light-year, or 7 days to travel 1 AU. The Milky Way is moving with respect to the cosmic microwave background radiation (CMB) in the direction of the constellation Hydra with a speed of 550 km/s, and the Sun's resultant velocity with respect to the CMB is about 370 km/s in the direction of Crater or Leo. The temperature of the photosphere is approximately 6,000 K, whereas the temperature of the corona reaches 1,000,000–2,000,000 K. The high temperature of the corona shows that it is heated by something other than direct heat conduction from the photosphere. It is thought that the energy necessary to heat the corona is provided by turbulent motion in the convection zone below the photosphere, and two main mechanisms have been proposed to explain coronal heating. The first is wave heating, in which sound, gravitational or magnetohydrodynamic waves are produced by turbulence in the convection zone. These waves travel upward and dissipate in the corona, depositing their energy in the ambient matter in the form of heat. The other is magnetic heating, in which magnetic energy is continuously built up by photospheric motion and released through magnetic reconnection in the form of large solar flares and myriad similar but smaller events—nanoflares. Theoretical models of the Sun's development suggest that 3.8 to 2.5 billion years ago, during the Archean eon, the Sun was only about 75% as bright as it is today. Such a weak star would not have been able to sustain liquid water on Earth's surface, and thus life should not have been able to develop. However, the geological record demonstrates that Earth has remained at a fairly constant temperature throughout its history, and that the young Earth was somewhat warmer than it is today. One theory among scientists is that the atmosphere of the young Earth contained much larger quantities of greenhouse gases (such as carbon dioxide, methane) than are present today, which trapped enough heat to compensate for the smaller amount of solar energy reaching it. However, examination of Archaean sediments appears inconsistent with the hypothesis of high greenhouse concentrations. Instead, the moderate temperature range may be explained by a lower surface albedo brought about by less continental area and the "lack of biologically induced cloud condensation nuclei". This would have led to increased absorption of solar energy, thereby compensating for the lower solar output. The enormous effect of the Sun on Earth has been recognized since prehistoric times, and the Sun has been regarded by some cultures as a deity. The Sun has been an object of veneration in many cultures throughout human history. Humanity's most fundamental understanding of the Sun is as the luminous disk in the sky, whose presence above the horizon creates day and whose absence causes night. In many prehistoric and ancient cultures, the Sun was thought to be a solar deity or other supernatural entity. Worship of the Sun was central to civilizations such as the ancient Egyptians, the Inca of South America and the Aztecs of what is now Mexico. In religions such as Hinduism, the Sun is still considered a god. Many ancient monuments were constructed with solar phenomena in mind; for example, stone megaliths accurately mark the summer or winter solstice (some of the most prominent megaliths are located in Nabta Playa, Egypt; Mnajdra, Malta and at Stonehenge, England); Newgrange, a prehistoric human-built mount in Ireland, was designed to detect the winter solstice; the pyramid of El Castillo at Chichén Itzá in Mexico is designed to cast shadows in the shape of serpents climbing the pyramid at the vernal and autumnal equinoxes. The Egyptians portrayed the god Ra as being carried across the sky in a solar barque, accompanied by lesser gods, and to the Greeks, he was Helios, carried by a chariot drawn by fiery horses. From the reign of Elagabalus in the late Roman Empire the Sun's birthday was a holiday celebrated as Sol Invictus (literally "Unconquered Sun") soon after the winter solstice, which may have been an antecedent to Christmas. Regarding the fixed stars, the Sun appears from Earth to revolve once a year along the ecliptic through the zodiac, and so Greek astronomers categorized it as one of the seven planets (Greek planetes, "wanderer"); the naming of the days of the weeks after the seven planets dates to the Roman era. In the early first millennium BC, Babylonian astronomers observed that the Sun's motion along the ecliptic is not uniform, though they did not know why; it is today known that this is due to the movement of Earth in an elliptic orbit around the Sun, with Earth moving faster when it is nearer to the Sun at perihelion and moving slower when it is farther away at aphelion. One of the first people to offer a scientific or philosophical explanation for the Sun was the Greek philosopher Anaxagoras. 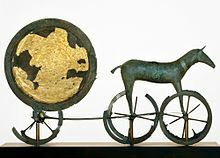 He reasoned that it was not the chariot of Helios, but instead a giant flaming ball of metal even larger than the land of the Peloponnesus and that the Moon reflected the light of the Sun. For teaching this heresy, he was imprisoned by the authorities and sentenced to death, though he was later released through the intervention of Pericles. Eratosthenes estimated the distance between Earth and the Sun in the 3rd century BC as "of stadia myriads 400 and 80000", the translation of which is ambiguous, implying either 4,080,000 stadia (755,000 km) or 804,000,000 stadia (148 to 153 million kilometers or 0.99 to 1.02 AU); the latter value is correct to within a few percent. In the 1st century AD, Ptolemy estimated the distance as 1,210 times the radius of Earth, approximately 7.71 million kilometers (0.0515 AU). The theory that the Sun is the center around which the planets orbit was first proposed by the ancient Greek Aristarchus of Samos in the 3rd century BC, and later adopted by Seleucus of Seleucia (see Heliocentrism). This view was developed in a more detailed mathematical model of a heliocentric system in the 16th century by Nicolaus Copernicus. Observations of sunspots were recorded during the Han Dynasty (206 BC–AD 220) by Chinese astronomers, who maintained records of these observations for centuries. Averroes also provided a description of sunspots in the 12th century. The invention of the telescope in the early 17th century permitted detailed observations of sunspots by Thomas Harriot, Galileo Galilei and other astronomers. Galileo posited that sunspots were on the surface of the Sun rather than small objects passing between Earth and the Sun. Arabic astronomical contributions include Albatenius' discovery that the direction of the Sun's apogee (the place in the Sun's orbit against the fixed stars where it seems to be moving slowest) is changing. (In modern heliocentric terms, this is caused by a gradual motion of the aphelion of the Earth's orbit). Ibn Yunus observed more than 10,000 entries for the Sun's position for many years using a large astrolabe. 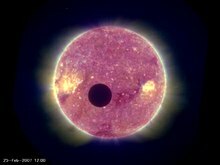 From an observation of a transit of Venus in 1032, the Persian astronomer and polymath Avicenna concluded that Venus is closer to Earth than the Sun. In 1672 Giovanni Cassini and Jean Richer determined the distance to Mars and were thereby able to calculate the distance to the Sun. In 1666, Isaac Newton observed the Sun's light using a prism, and showed that it is made up of light of many colors. 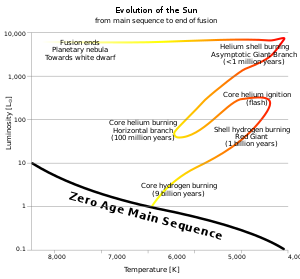 In 1800, William Herschel discovered infrared radiation beyond the red part of the solar spectrum. The 19th century saw advancement in spectroscopic studies of the Sun; Joseph von Fraunhofer recorded more than 600 absorption lines in the spectrum, the strongest of which are still often referred to as Fraunhofer lines. In the early years of the modern scientific era, the source of the Sun's energy was a significant puzzle. Lord Kelvin suggested that the Sun is a gradually cooling liquid body that is radiating an internal store of heat. Kelvin and Hermann von Helmholtz then proposed a gravitational contraction mechanism to explain the energy output, but the resulting age estimate was only 20 million years, well short of the time span of at least 300 million years suggested by some geological discoveries of that time. In 1890 Joseph Lockyer, who discovered helium in the solar spectrum, proposed a meteoritic hypothesis for the formation and evolution of the Sun. Not until 1904 was a documented solution offered. Ernest Rutherford suggested that the Sun's output could be maintained by an internal source of heat, and suggested radioactive decay as the source. However, it would be Albert Einstein who would provide the essential clue to the source of the Sun's energy output with his mass-energy equivalence relation E = mc2. In 1920, Sir Arthur Eddington proposed that the pressures and temperatures at the core of the Sun could produce a nuclear fusion reaction that merged hydrogen (protons) into helium nuclei, resulting in a production of energy from the net change in mass. The preponderance of hydrogen in the Sun was confirmed in 1925 by Cecilia Payne using the ionization theory developed by Meghnad Saha, an Indian physicist. The theoretical concept of fusion was developed in the 1930s by the astrophysicists Subrahmanyan Chandrasekhar and Hans Bethe. Hans Bethe calculated the details of the two main energy-producing nuclear reactions that power the Sun. In 1957, Margaret Burbidge, Geoffrey Burbidge, William Fowler and Fred Hoyle showed that most of the elements in the universe have been synthesized by nuclear reactions inside stars, some like the Sun. The first satellites designed for long term observation of the Sun from interplanetary space were NASA's Pioneers 6, 7, 8 and 9, which were launched between 1959 and 1968. These probes orbited the Sun at a distance similar to that of Earth, and made the first detailed measurements of the solar wind and the solar magnetic field. Pioneer 9 operated for a particularly long time, transmitting data until May 1983. In 1980, the Solar Maximum Mission was launched by NASA. This spacecraft was designed to observe gamma rays, X-rays and UV radiation from solar flares during a time of high solar activity and solar luminosity. Just a few months after launch, however, an electronics failure caused the probe to go into standby mode, and it spent the next three years in this inactive state. In 1984 Space Shuttle Challenger mission STS-41C retrieved the satellite and repaired its electronics before re-releasing it into orbit. The Solar Maximum Mission subsequently acquired thousands of images of the solar corona before re-entering Earth's atmosphere in June 1989. One of the most important solar missions to date has been the Solar and Heliospheric Observatory, jointly built by the European Space Agency and NASA and launched on 2 December 1995. Originally intended to serve a two-year mission, a mission extension through 2012 was approved in October 2009. It has proven so useful that a follow-on mission, the Solar Dynamics Observatory (SDO), was launched in February 2010. Situated at the Lagrangian point between Earth and the Sun (at which the gravitational pull from both is equal), SOHO has provided a constant view of the Sun at many wavelengths since its launch. Besides its direct solar observation, SOHO has enabled the discovery of a large number of comets, mostly tiny sungrazing comets that incinerate as they pass the Sun. All these satellites have observed the Sun from the plane of the ecliptic, and so have only observed its equatorial regions in detail. The Ulysses probe was launched in 1990 to study the Sun's polar regions. It first travelled to Jupiter, to "slingshot" into an orbit that would take it far above the plane of the ecliptic. Once Ulysses was in its scheduled orbit, it began observing the solar wind and magnetic field strength at high solar latitudes, finding that the solar wind from high latitudes was moving at about 750 km/s, which was slower than expected, and that there were large magnetic waves emerging from high latitudes that scattered galactic cosmic rays. Elemental abundances in the photosphere are well known from spectroscopic studies, but the composition of the interior of the Sun is more poorly understood. A solar wind sample return mission, Genesis, was designed to allow astronomers to directly measure the composition of solar material. The Solar Terrestrial Relations Observatory (STEREO) mission was launched in October 2006. Two identical spacecraft were launched into orbits that cause them to (respectively) pull further ahead of and fall gradually behind Earth. This enables stereoscopic imaging of the Sun and solar phenomena, such as coronal mass ejections. The Indian Space Research Organisation has scheduled the launch of a 100 kg satellite named Aditya for 2017–18. Its main instrument will be a coronagraph for studying the dynamics of the Solar corona. During certain atmospheric conditions, the Sun becomes clearly visible to the naked eye, and can be observed without stress to the eyes. Click on this photo to see the full cycle of a sunset, as observed from the high plains of the Mojave Desert. Viewing the Sun through light-concentrating optics such as binoculars may result in permanent damage to the retina without an appropriate filter that blocks UV and substantially dims the sunlight. When using an attenuating filter to view the Sun, the viewer is cautioned to use a filter specifically designed for that use. Some improvised filters that pass UV or IR rays, can actually harm the eye at high brightness levels.Herschel wedges, also called Solar Diagonals, are effective and inexpensive for small telescopes. The sunlight that is destined for the eyepiece is reflected from an unsilvered surface of a piece of glass. Only a very small fraction of the incident light is reflected. The rest passes through the glass and leaves the instrument. If the glass breaks because of the heat, no light at all is reflected, making the device fail-safe. Simple filters made of darkened glass allow the full intensity of sunlight to pass through if they break, endangering the observer's eyesight. Unfiltered binoculars can deliver hundreds of times as much energy as using the naked eye, possibly causing immediate damage. It is claimed that even brief glances at the midday Sun through an unfiltered telescope can cause permanent damage. During sunrise and sunset, sunlight is attenuated because of Rayleigh scattering and Mie scattering from a particularly long passage through Earth's atmosphere, and the Sun is sometimes faint enough to be viewed comfortably with the naked eye or safely with optics (provided there is no risk of bright sunlight suddenly appearing through a break between clouds). Hazy conditions, atmospheric dust, and high humidity contribute to this atmospheric attenuation. An optical phenomenon, known as a green flash, can sometimes be seen shortly after sunset or before sunrise. The flash is caused by light from the Sun just below the horizon being bent (usually through a temperature inversion) towards the observer. Light of shorter wavelengths (violet, blue, green) is bent more than that of longer wavelengths (yellow, orange, red) but the violet and blue light is scattered more, leaving light that is perceived as green. Ultraviolet light from the Sun has antiseptic properties and can be used to sanitize tools and water. It also causes sunburn, and has other biological effects such as the production of vitamin D and sun tanning. Ultraviolet light is strongly attenuated by Earth's ozone layer, so that the amount of UV varies greatly with latitude and has been partially responsible for many biological adaptations, including variations in human skin color in different regions of the Earth. The Sun has eight known planets. This includes four terrestrial planets (Mercury, Venus, Earth, and Mars), two gas giants (Jupiter and Saturn), and two ice giants (Uranus and Neptune). The Solar System also has at least five dwarf planets, an asteroid belt, numerous comets, and a large number of icy bodies which lie beyond the orbit of Neptune. Solar deities play a major role in many world religions and mythologies. The ancient Sumerians believed that the sun was Utu, the god of justice and twin brother of Inanna, the Queen of Heaven, who was identified as the planet Venus. Later, Utu was identified with the East Semitic god Shamash. Utu was regarded as a helper-deity, who aided those in distress, and, in iconography, he is usually portrayed with a long beard and clutching a saw, which represented his role as the dispenser of justice. From at least the 4th Dynasty of Ancient Egypt, the Sun was worshipped as the god Ra, portrayed as a falcon-headed divinity surmounted by the solar disk, and surrounded by a serpent. In the New Empire period, the Sun became identified with the dung beetle, whose spherical ball of dung was identified with the Sun. In the form of the sun disc Aten, the Sun had a brief resurgence during the Amarna Period when it again became the preeminent, if not only, divinity for the Pharaoh Akhenaton. In Proto-Indo-European religion, the Sun was personified as the goddess *Seh2ul. Derivatives of this goddess in Indo-European languages include the Old Norse Sól, Sanskrit Surya, Gaulish Sulis, Lithuanian Saulė, and Slavic Solntse. In ancient Greek religion, the sun deity was the male god Helios, but traces of an earlier female solar deity are preserved in Helen of Troy. In later times, Helios was syncretized with Apollo. In the Bible, Malachi 4:2 mentions the "Sun of Righteousness" (sometimes translated as the "Sun of Justice"), which some Christians have interpreted as a reference to the Messiah (Christ). In ancient Roman culture, Sunday was the day of the sun god. It was adopted as the Sabbath day by Christians who did not have a Jewish background. The symbol of light was a pagan device adopted by Christians, and perhaps the most important one that did not come from Jewish traditions. In paganism, the Sun was a source of life, giving warmth and illumination to mankind. It was the center of a popular cult among Romans, who would stand at dawn to catch the first rays of sunshine as they prayed. The celebration of the winter solstice (which influenced Christmas) was part of the Roman cult of the unconquered Sun (Sol Invictus). Christian churches were built with an orientation so that the congregation faced toward the sunrise in the East. Tonatiuh, the Aztec god of the sun, was usually depicted holding arrows and a shield and was closely associated with the practice of human sacrifice. The sun goddess Amaterasu is the most important deity in the Shinto religion, and she is believed to be the direct ancestor of all Japanese emperors. ^ a b c All numbers in this article are short scale. One billion is 109, or 1,000,000,000. ^ In astronomical sciences, the term heavy elements (or metals) refers to all elements except hydrogen and helium. ^ Hydrothermal vent communities live so deep under the sea that they have no access to sunlight. Bacteria instead use sulfur compounds as an energy source, via chemosynthesis. ^ 1.88 Gcd/m2 is calculated from the solar illuminance of 7005128000000000000♠128000 lux (see sunlight) times the square of the distance to the center of the Sun, divided by the cross sectional area of the Sun. 1.44 Gcd/m2 is calculated using 7004980000000000000♠98000 lux. ^ A 50 kg adult human has a volume of about 0.05 m3, which corresponds to 13.8 watts, at the volumetric power of the solar center. This is 285 kcal/day, about 10% of the actual average caloric intake and output for humans in non-stressful conditions. ^ Earth's atmosphere near sea level has a particle density of about 2×1025 m−3. ^ Pitjeva, E. V.; Standish, E. M. (2009). "Proposals for the masses of the three largest asteroids, the Moon-Earth mass ratio and the Astronomical Unit". Celestial Mechanics and Dynamical Astronomy. 103 (4): 365–372. doi:10.1007/s10569-009-9203-8. ISSN 1572-9478. ^ a b c d e f g h i j k l m n o p q r Williams, D.R. (1 July 2013). "Sun Fact Sheet". NASA Goddard Space Flight Center. Archived from the original on 15 July 2010. Retrieved 12 August 2013. ^ Zombeck, Martin V. (1990). Handbook of Space Astronomy and Astrophysics 2nd edition. Cambridge University Press. ^ Asplund, M.; Grevesse, N.; Sauval, A.J. (2006). "The new solar abundances – Part I: the observations". Communications in Asteroseismology. 147: 76–79. Bibcode:2006CoAst.147...76A. doi:10.1553/cia147s76. ^ "Eclipse 99: Frequently Asked Questions". NASA. Archived from the original on 27 May 2010. Retrieved 24 October 2010. ^ Hinshaw, G.; et al. (2009). "Five-year Wilkinson Microwave Anisotropy Probe observations: data processing, sky maps, and basic results". The Astrophysical Journal Supplement Series. 180 (2): 225–245. arXiv:0803.0732. Bibcode:2009ApJS..180..225H. doi:10.1088/0067-0049/180/2/225. ^ a b c d e f g h i j k l "Solar System Exploration: Planets: Sun: Facts & Figures". NASA. Archived from the original on 2 January 2008. ^ Ko, M. (1999). Elert, G. (ed.). "Density of the Sun". The Physics Factbook. ^ a b c Bonanno, A.; Schlattl, H.; Paternò, L. (2002). "The age of the Sun and the relativistic corrections in the EOS". Astronomy and Astrophysics. 390 (3): 1115–1118. arXiv:astro-ph/0204331. Bibcode:2002A&A...390.1115B. doi:10.1051/0004-6361:20020749. ^ a b Seidelmann, P.K. ; et al. (2000). "Report Of The IAU/IAG Working Group On Cartographic Coordinates And Rotational Elements Of The Planets And Satellites: 2000". Retrieved 22 March 2006. ^ "The Sun's Vital Statistics". Stanford Solar Center. Retrieved 29 July 2008. Citing Eddy, J. (1979). A New Sun: The Solar Results From Skylab. NASA. p. 37. NASA SP-402. ^ "How Round is the Sun?". NASA. 2 October 2008. Retrieved 7 March 2011. ^ "First Ever STEREO Images of the Entire Sun". NASA. 6 February 2011. Retrieved 7 March 2011. ^ a b Charbonneau, P. (2014). "Solar Dynamo Theory". Annual Review of Astronomy and Astrophysics. 52: 251–290. Bibcode:2014ARA&A..52..251C. doi:10.1146/annurev-astro-081913-040012. ^ Woolfson, M. (2000). "The origin and evolution of the solar system". Astronomy & Geophysics. 41 (1): 12. Bibcode:2000A&G....41a..12W. doi:10.1046/j.1468-4004.2000.00012.x. ^ a b Basu, S.; Antia, H.M. (2008). "Helioseismology and Solar Abundances". Physics Reports. 457 (5–6): 217–283. arXiv:0711.4590. Bibcode:2008PhR...457..217B. doi:10.1016/j.physrep.2007.12.002. ^ Connelly, James N.; Bizzarro, Martin; Krot, Alexander N.; Nordlund, Åke; Wielandt, Daniel; Ivanova, Marina A. (2 November 2012). "The Absolute Chronology and Thermal Processing of Solids in the Solar Protoplanetary Disk". Science. 338 (6107): 651–655. Bibcode:2012Sci...338..651C. doi:10.1126/science.1226919. PMID 23118187. ^ Barnhart, R.K. (1995). The Barnhart Concise Dictionary of Etymology. HarperCollins. p. 776. ISBN 978-0-06-270084-1. ^ a b c Mallory, J.P. (1989). In Search of the Indo-Europeans: Language, Archaeology and Myth. Thames & Hudson. p. 129. ISBN 978-0-500-27616-7. ^ "Opportunity's View, Sol 959 (Vertical)". NASA. 15 November 2006. Retrieved 1 August 2007. ^ Little, William; Fowler, H.W. ; Coulson, J. (1955). "Sol". Oxford Universal Dictionary on Historical Principles (3rd ed.). ASIN B000QS3QVQ. ^ "Sol". Merriam-Webster. Retrieved 19 July 2009. ^ Allison, M.; Schmunk, R. (8 August 2012). "Technical Notes on Mars Solar Time as Adopted by the Mars24 Sunclock". NASA/GISS. Retrieved 16 September 2012. ^ Barnhart, R.K. (1995). The Barnhart Concise Dictionary of Etymology. HarperCollins. p. 778. ISBN 978-0-06-270084-1. ^ Than, K. (2006). "Astronomers Had it Wrong: Most Stars are Single". Space.com. Retrieved 1 August 2007. ^ Lada, C.J. (2006). "Stellar multiplicity and the initial mass function: Most stars are single". Astrophysical Journal Letters. 640 (1): L63–L66. arXiv:astro-ph/0601375. Bibcode:2006ApJ...640L..63L. doi:10.1086/503158. ^ a b Zeilik, M.A. ; Gregory, S.A. (1998). Introductory Astronomy & Astrophysics (4th ed.). Saunders College Publishing. p. 322. ISBN 978-0-03-006228-5. ^ Falk, S.W. ; Lattmer, J.M. ; Margolis, S.H. (1977). "Are supernovae sources of presolar grains?". Nature. 270 (5639): 700–701. Bibcode:1977Natur.270..700F. doi:10.1038/270700a0. ^ Burton, W.B. (1986). "Stellar parameters". Space Science Reviews. 43 (3–4): 244–250. doi:10.1007/BF00190626. ^ Bessell, M.S. ; Castelli, F.; Plez, B. (1998). "Model atmospheres broad-band colors, bolometric corrections and temperature calibrations for O–M stars". Astronomy and Astrophysics. 333: 231–250. Bibcode:1998A&A...333..231B. ^ "Equinoxes, Solstices, Perihelion, and Aphelion, 2000–2020". US Naval Observatory. 31 January 2008. Retrieved 17 July 2009. ^ Simon, A. (2001). The Real Science Behind the X-Files : Microbes, meteorites, and mutants. Simon & Schuster. pp. 25–27. ISBN 978-0-684-85618-6. ^ Beer, J.; McCracken, K.; von Steiger, R. (2012). Cosmogenic Radionuclides: Theory and Applications in the Terrestrial and Space Environments. Springer Science+Business Media. p. 41. ISBN 978-3-642-14651-0. ^ Phillips, K.J.H. (1995). Guide to the Sun. Cambridge University Press. p. 73. ISBN 978-0-521-39788-9. ^ Jones, G. (16 August 2012). "Sun is the most perfect sphere ever observed in nature". The Guardian. Retrieved 19 August 2013. ^ Schutz, B.F. (2003). Gravity from the ground up. Cambridge University Press. pp. 98–99. ISBN 978-0-521-45506-0. ^ Phillips, K.J.H. (1995). Guide to the Sun. Cambridge University Press. pp. 78–79. ISBN 978-0-521-39788-9. ^ "Construction of a Composite Total Solar Irradiance (TSI) Time Series from 1978 to present". Archived from the original on 22 August 2011. Retrieved 5 October 2005. ^ El-Sharkawi, Mohamed A. (2005). Electric energy. CRC Press. pp. 87–88. ISBN 978-0-8493-3078-0. ^ Phillips, K.J.H. (1995). Guide to the Sun. Cambridge University Press. pp. 14–15, 34–38. ISBN 978-0-521-39788-9. ^ "What Color is the Sun?". Universe Today. Retrieved 23 May 2016. ^ "What Color is the Sun?". Stanford Solar Center. Retrieved 23 May 2016. ^ Wilk, S.R. (2009). "The Yellow Sun Paradox". Optics & Photonics News: 12–13. Archived from the original on 18 June 2012. ^ a b c Phillips, K.J.H. (1995). Guide to the Sun. Cambridge University Press. pp. 47–53. ISBN 978-0-521-39788-9. ^ a b Lodders, Katharina (10 July 2003). "Solar System Abundances and Condensation Temperatures of the Elements" (PDF). The Astrophysical Journal. 591 (2): 1220–1247. Bibcode:2003ApJ...591.1220L. doi:10.1086/375492. Lodders, K. (2003). "Abundances and Condensation Temperatures of the Elements" (PDF). Meteoritics & Planetary Science. 38 (suppl): 5272. Bibcode:2003M&PSA..38.5272L. ^ Hansen, C.J. ; Kawaler, S.A.; Trimble, V. (2004). Stellar Interiors: Physical Principles, Structure, and Evolution (2nd ed.). Springer. pp. 19–20. ISBN 978-0-387-20089-7. ^ Hansen, C.J. ; Kawaler, S.A.; Trimble, V. (2004). Stellar Interiors: Physical Principles, Structure, and Evolution (2nd ed.). Springer. pp. 77–78. ISBN 978-0-387-20089-7. ^ Hansen, C.J. ; Kawaler, S.A.; Trimble, V. (2004). Stellar Interiors: Physical Principles, Structure, and Evolution (2nd ed.). Springer. § 9.2.3. ISBN 978-0-387-20089-7. ^ Aller, L.H. (1968). "The chemical composition of the Sun and the solar system". Proceedings of the Astronomical Society of Australia. 1 (4): 133. Bibcode:1968PASAu...1..133A. doi:10.1017/S1323358000011048. ^ a b c Biemont, E. (1978). "Abundances of singly ionized elements of the iron group in the Sun". Monthly Notices of the Royal Astronomical Society. 184 (4): 683–694. Bibcode:1978MNRAS.184..683B. doi:10.1093/mnras/184.4.683. ^ a b Manuel, O.K. ; Hwaung, G. (1983). "Solar abundances of the elements". Meteoritics. 18 (3): 209–222. Bibcode:1983Metic..18..209M. doi:10.1111/j.1945-5100.1983.tb00822.x. ^ a b García, R.; et al. (2007). "Tracking solar gravity modes: the dynamics of the solar core". Science. 316 (5831): 1591–1593. Bibcode:2007Sci...316.1591G. doi:10.1126/science.1140598. PMID 17478682. ^ Basu, S.; et al. (2009). "Fresh insights on the structure of the solar core". The Astrophysical Journal. 699 (2): 1403–1417. arXiv:0905.0651. Bibcode:2009ApJ...699.1403B. doi:10.1088/0004-637X/699/2/1403. ^ a b c d e f g "NASA/Marshall Solar Physics". Marshall Space Flight Center. 18 January 2007. Retrieved 11 July 2009. ^ Broggini, C. (2003). Physics in Collision, Proceedings of the XXIII International Conference: Nuclear Processes at Solar Energy. XXIII Physics in Collisions Conference. Zeuthen, Germany. p. 21. arXiv:astro-ph/0308537. Bibcode:2003phco.conf...21B. ^ Goupil, M.J.; Lebreton, Y.; Marques, J.P.; Samadi, R.; Baudin, F. (2011). "Open issues in probing interiors of solar-like oscillating main sequence stars 1. From the Sun to nearly suns". Journal of Physics: Conference Series. 271 (1): 012031. arXiv:1102.0247. Bibcode:2011JPhCS.271a2031G. doi:10.1088/1742-6596/271/1/012031. ^ Zirker, J.B. (2002). Journey from the Center of the Sun. Princeton University Press. pp. 15–34. ISBN 978-0-691-05781-1. ^ Shu, F.H. (1982). The Physical Universe: An Introduction to Astronomy. University Science Books. p. 102. ISBN 978-0-935702-05-7. ^ "Ask Us: Sun". Cosmicopia. NASA. 2012. Retrieved 13 July 2017. ^ Cohen, H. (9 November 1998). 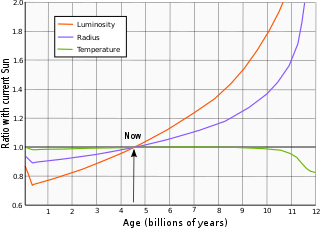 "Table of temperatures, power densities, luminosities by radius in the Sun". Contemporary Physics Education Project. Archived from the original on 29 November 2001. Retrieved 30 August 2011. ^ "Lazy Sun is less energetic than compost". 17 April 2012. ^ Haubold, H.J. ; Mathai, A.M. (1994). "Solar Nuclear Energy Generation & The Chlorine Solar Neutrino Experiment". AIP Conference Proceedings. 320 (1994): 102–116. arXiv:astro-ph/9405040. Bibcode:1995AIPC..320..102H. CiteSeerX 10.1.1.254.6033. doi:10.1063/1.47009. ^ Myers, S.T. (18 February 1999). "Lecture 11 – Stellar Structure I: Hydrostatic Equilibrium". Introduction to Astrophysics II. Retrieved 15 July 2009. ^ a b c d e "Sun". World Book at NASA. NASA. Archived from the original on 10 May 2013. Retrieved 10 October 2012. ^ Tobias, S.M. (2005). "The solar tachocline: Formation, stability and its role in the solar dynamo". In A.M. Soward; et al. (eds.). Fluid Dynamics and Dynamos in Astrophysics and Geophysics. CRC Press. pp. 193–235. ISBN 978-0-8493-3355-2. ^ Mullan, D.J (2000). "Solar Physics: From the Deep Interior to the Hot Corona". In Page, D.; Hirsch, J.G. (eds.). From the Sun to the Great Attractor. Springer. p. 22. ISBN 978-3-540-41064-5. ^ a b c d e f g Abhyankar, K.D. (1977). "A Survey of the Solar Atmospheric Models". Bulletin of the Astronomical Society of India. 5: 40–44. Bibcode:1977BASI....5...40A. ^ Gibson, Edward G. (1973). The Quiet Sun (NASA SP-303). NASA. ASIN B0006C7RS0. ^ Shu, F.H. (1991). The Physics of Astrophysics. 1. University Science Books. ISBN 978-0-935702-64-4. ^ Rast, M.; Nordlund, Å.; Stein, R.; Toomre, J. (1993). "Ionization Effects in Three-Dimensional Solar Granulation Simulations". The Astrophysical Journal Letters. 408 (1): L53–L56. Bibcode:1993ApJ...408L..53R. doi:10.1086/186829. ^ Parnel, C. "Discovery of Helium". University of St Andrews. Retrieved 22 March 2006. ^ Solanki, S.K. ; Livingston, W.; Ayres, T. (1994). "New Light on the Heart of Darkness of the Solar Chromosphere". Science. 263 (5143): 64–66. Bibcode:1994Sci...263...64S. doi:10.1126/science.263.5143.64. PMID 17748350. ^ De Pontieu, B.; et al. (2007). "Chromospheric Alfvénic Waves Strong Enough to Power the Solar Wind". Science. 318 (5856): 1574–1577. Bibcode:2007Sci...318.1574D. doi:10.1126/science.1151747. PMID 18063784. ^ a b c Hansteen, V.H. ; Leer, E.; Holzer, T.E. (1997). "The role of helium in the outer solar atmosphere". The Astrophysical Journal. 482 (1): 498–509. Bibcode:1997ApJ...482..498H. doi:10.1086/304111. ^ a b c d e f g Erdèlyi, R.; Ballai, I. (2007). "Heating of the solar and stellar coronae: a review". Astron. Nachr. 328 (8): 726–733. Bibcode:2007AN....328..726E. doi:10.1002/asna.200710803. ^ a b c d e Dwivedi, B.N. (2006). "Our ultraviolet Sun" (PDF). Current Science. 91 (5): 587–595. ^ a b c d e f g Russell, C.T. (2001). "Solar wind and interplanetary magnetic filed: A tutorial". In Song, Paul; Singer, Howard J.; Siscoe, George L. (eds.). Space Weather (Geophysical Monograph) (PDF). American Geophysical Union. pp. 73–88. ISBN 978-0-87590-984-4. ^ A.G, Emslie; J.A., Miller (2003). "Particle Acceleration". In Dwivedi, B.N. (ed.). Dynamic Sun. Cambridge University Press. p. 275. ISBN 978-0-521-81057-9. ^ "A Star with two North Poles". Science @ NASA. NASA. 22 April 2003. Archived from the original on 18 July 2009. ^ Riley, P.; Linker, J.A. ; Mikić, Z. (2002). "Modeling the heliospheric current sheet: Solar cycle variations" (PDF). Journal of Geophysical Research. 107 (A7): SSH 8–1. Bibcode:2002JGRA..107.1136R. doi:10.1029/2001JA000299. CiteID 1136. Archived from the original (PDF) on 14 August 2009. ^ "The Distortion of the Heliosphere: Our Interstellar Magnetic Compass" (Press release). European Space Agency. 2005. Retrieved 22 March 2006. ^ Anderson, Rupert W. (2015). The Cosmic Compendium: Interstellar Travel. pp. 163–164. ISBN 978-1-329-02202-7. ^ "Ancient sunlight". Technology Through Time. NASA. 2007. Retrieved 24 June 2009. ^ Stix, M. (2003). "On the time scale of energy transport in the sun". Solar Physics. 212 (1): 3–6. Bibcode:2003SoPh..212....3S. doi:10.1023/A:1022952621810. ^ Schlattl, H. (2001). "Three-flavor oscillation solutions for the solar neutrino problem". Physical Review D. 64 (1): 013009. arXiv:hep-ph/0102063. Bibcode:2001PhRvD..64a3009S. doi:10.1103/PhysRevD.64.013009. ^ "The Mean Magnetic Field of the Sun". Wilcox Solar Observatory. 2006. Retrieved 1 August 2007. ^ Zirker, J.B. (2002). Journey from the Center of the Sun. Princeton University Press. pp. 119–120. ISBN 978-0-691-05781-1. ^ Lang, Kenneth R. (2008). The Sun from Space. Springer-Verlag. p. 75. ISBN 978-3-540-76952-1. ^ "The Largest Sunspot in Ten Years". Goddard Space Flight Center. 30 March 2001. Archived from the original on 23 August 2007. Retrieved 10 July 2009. ^ Hale, G.E. ; Ellerman, F.; Nicholson, S.B. ; Joy, A.H. (1919). "The Magnetic Polarity of Sun-Spots". The Astrophysical Journal. 49: 153. Bibcode:1919ApJ....49..153H. doi:10.1086/142452. ^ Phillips, T. (15 February 2001). "The Sun Does a Flip". NASA. Archived from the original on 12 May 2009. Retrieved 11 July 2009. ^ Wang, Y.-M.; Sheeley, N.R. (2003). "Modeling the Sun's Large-Scale Magnetic Field during the Maunder Minimum". The Astrophysical Journal. 591 (2): 1248–1256. Bibcode:2003ApJ...591.1248W. doi:10.1086/375449. ^ Zirker, J.B. (2002). Journey from the Center of the Sun. Princeton University Press. pp. 120–127. ISBN 978-0-691-05781-1. ^ Willson, R.C. ; Hudson, H.S. (1991). "The Sun's luminosity over a complete solar cycle". Nature. 351 (6321): 42–44. Bibcode:1991Natur.351...42W. doi:10.1038/351042a0. ^ Eddy, John A. (June 1976). "The Maunder Minimum". Science. 192 (4245): 1189–1202. Bibcode:1976Sci...192.1189E. doi:10.1126/science.192.4245.1189. JSTOR 17425839. PMID 17771739. ^ Lean, J.; Skumanich, A.; White, O. (1992). "Estimating the Sun's radiative output during the Maunder Minimum". Geophysical Research Letters. 19 (15): 1591–1594. Bibcode:1992GeoRL..19.1591L. doi:10.1029/92GL01578. ^ Mackay, R.M. ; Khalil, M.A.K (2000). "Greenhouse gases and global warming". In Singh, S.N. (ed.). Trace Gas Emissions and Plants. Springer. pp. 1–28. ISBN 978-0-7923-6545-7. ^ Ehrlich, R. (2007). "Solar Resonant Diffusion Waves as a Driver of Terrestrial Climate Change". Journal of Atmospheric and Solar-Terrestrial Physics. 69 (7): 759–766. arXiv:astro-ph/0701117. Bibcode:2007JASTP..69..759E. doi:10.1016/j.jastp.2007.01.005. ^ Clark, S. (2007). "Sun's fickle heart may leave us cold". New Scientist. 193 (2588): 12. doi:10.1016/S0262-4079(07)60196-1. ^ Zirker, Jack B. (2002). Journey from the Center of the Sun. Princeton University Press. pp. 7–8. ISBN 978-0-691-05781-1. ^ Amelin, Y.; Krot, A.; Hutcheon, I.; Ulyanov, A. (2002). "Lead isotopic ages of chondrules and calcium-aluminum-rich inclusions". Science. 297 (5587): 1678–1683. Bibcode:2002Sci...297.1678A. doi:10.1126/science.1073950. PMID 12215641. ^ Baker, J.; Bizzarro, M.; Wittig, N.; Connelly, J.; Haack, H. (2005). "Early planetesimal melting from an age of 4.5662 Gyr for differentiated meteorites". Nature. 436 (7054): 1127–1131. Bibcode:2005Natur.436.1127B. doi:10.1038/nature03882. PMID 16121173. ^ Williams, J. (2010). "The astrophysical environment of the solar birthplace". Contemporary Physics. 51 (5): 381–396. arXiv:1008.2973. Bibcode:2010ConPh..51..381W. CiteSeerX 10.1.1.740.2876. doi:10.1080/00107511003764725. ^ Goldsmith, D.; Owen, T. (2001). The search for life in the universe. University Science Books. p. 96. ISBN 978-1-891389-16-0. ^ "Earth Won't Die as Soon as Thought". 22 January 2014. ^ Nola Taylor Redd. 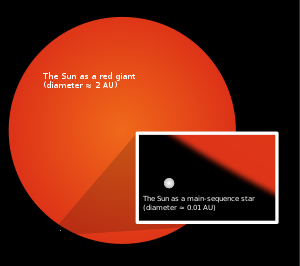 "Red Giant Stars: Facts, Definition & the Future of the Sun". space.com. Retrieved 20 February 2016. ^ a b c d e f Schröder, K.-P.; Connon Smith, R. (2008). "Distant future of the Sun and Earth revisited". Monthly Notices of the Royal Astronomical Society. 386 (1): 155–163. arXiv:0801.4031. Bibcode:2008MNRAS.386..155S. doi:10.1111/j.1365-2966.2008.13022.x. ^ Boothroyd, A.I. ; Sackmann, I.‐J. (1999). "The CNO Isotopes: Deep Circulation in Red Giants and First and Second Dredge‐up". The Astrophysical Journal. 510 (1): 232–250. arXiv:astro-ph/9512121. Bibcode:1999ApJ...510..232B. doi:10.1086/306546. ^ "The End Of The Sun". ^ "Into the Interstellar Void". Centauri Dreams. ^ Reid, M.J. (1993). "The distance to the center of the Galaxy". Annual Review of Astronomy and Astrophysics. 31 (1): 345–372. Bibcode:1993ARA&A..31..345R. doi:10.1146/annurev.aa.31.090193.002021. ^ Eisenhauer, F.; et al. (2003). "A Geometric Determination of the Distance to the Galactic Center". Astrophysical Journal. 597 (2): L121–L124. arXiv:astro-ph/0306220. Bibcode:2003ApJ...597L.121E. doi:10.1086/380188. ^ Horrobin, M.; et al. (2004). "First results from SPIFFI. I: The Galactic Center" (PDF). Astronomische Nachrichten. 325 (2): 120–123. Bibcode:2004AN....325...88H. doi:10.1002/asna.200310181. ^ Eisenhauer, F.; et al. (2005). "SINFONI in the Galactic Center: Young Stars and Infrared Flares in the Central Light-Month". Astrophysical Journal. 628 (1): 246–259. arXiv:astro-ph/0502129. Bibcode:2005ApJ...628..246E. doi:10.1086/430667. ^ Gehrels, Neil; Chen, Wan; Mereghetti, S. (25 February 1993). "The Geminga supernova as a possible cause of the local interstellar bubble". Nature. 361 (6414): 706–707. Bibcode:1993Natur.361..704B. doi:10.1038/361704a0. ^ Berghoefer, T.W. ; Breitschwerdt, D. (1 July 2002). "The origin of the young stellar population in the solar neighborhood - a link to the formation of the Local Bubble?". Astronomy & Astrophysics. 390 (1): 299–306. arXiv:astro-ph/0205128. Bibcode:2002A&A...390..299B. doi:10.1051/0004-6361:20020627. ^ English, J. (2000). "Exposing the Stuff Between the Stars" (Press release). Hubble News Desk. Retrieved 10 May 2007. ^ Adams, F.C. ; Graves, G.; Laughlin, G.J.M. (2004). "Red Dwarfs and the End of the Main Sequence" (PDF). Revista Mexicana de Astronomía y Astrofísica. 22: 46–49. Bibcode:2004RMxAC..22...46A. Archived from the original (PDF) on 26 July 2011. ^ B. Fuchs; et al. (2006). "The search for the origin of the Local Bubble redivivus". MNRAS. 373 (3): 993–1003. arXiv:astro-ph/0609227. Bibcode:2006MNRAS.373..993F. doi:10.1111/j.1365-2966.2006.11044.x. ^ Bobylev, Vadim V. (2010). "Searching for Stars Closely Encountering with the Solar System". Astronomy Letters. 36 (3): 220–226. arXiv:1003.2160. Bibcode:2010AstL...36..220B. doi:10.1134/S1063773710030060. ^ Moore, Patrick; Rees, Robin (2014). Patrick Moore's Data Book of Astronomy. Cambridge: Cambridge University Press. ISBN 978-1-139-49522-6. ^ Gillman, M.; Erenler, H. (2008). "The galactic cycle of extinction" (PDF). International Journal of Astrobiology. 7 (1): 17–26. Bibcode:2008IJAsB...7...17G. CiteSeerX 10.1.1.384.9224. doi:10.1017/S1473550408004047. ^ Leong, S. (2002). "Period of the Sun's Orbit around the Galaxy (Cosmic Year)". The Physics Factbook. Retrieved 10 May 2007. ^ Croswell, K. (2008). "Milky Way keeps tight grip on its neighbor". New Scientist. 199 (2669): 8. doi:10.1016/S0262-4079(08)62026-6. ^ Garlick, M.A. (2002). The Story of the Solar System. Cambridge University Press. p. 46. ISBN 978-0-521-80336-6. ^ Kogut, A.; et al. (1993). "Dipole Anisotropy in the COBE Differential Microwave Radiometers First-Year Sky Maps". Astrophysical Journal. 419 (1993): 1. arXiv:astro-ph/9312056. Bibcode:1993ApJ...419....1K. doi:10.1086/173453. ^ Alfvén, H. (1947). "Magneto-hydrodynamic waves, and the heating of the solar corona". Monthly Notices of the Royal Astronomical Society. 107 (2): 211–219. Bibcode:1947MNRAS.107..211A. doi:10.1093/mnras/107.2.211. ^ Parker, E.N. (1988). "Nanoflares and the solar X-ray corona". Astrophysical Journal. 330 (1): 474. Bibcode:1988ApJ...330..474P. doi:10.1086/166485. ^ Sturrock, P.A. ; Uchida, Y. (1981). "Coronal heating by stochastic magnetic pumping". Astrophysical Journal. 246 (1): 331. Bibcode:1981ApJ...246..331S. doi:10.1086/158926. hdl:2060/19800019786. ^ Kasting, J.F. ; Ackerman, T.P. (1986). "Climatic Consequences of Very High Carbon Dioxide Levels in the Earth's Early Atmosphere". Science. 234 (4782): 1383–1385. doi:10.1126/science.11539665. PMID 11539665. ^ Rosing, Minik T.; Bird, Dennis K.; Sleep, Norman H.; Bjerrum, Christian J. (1 April 2010). "No climate paradox under the faint early Sun". Nature. 464 (7289): 744–747. Bibcode:2010Natur.464..744R. doi:10.1038/nature08955. PMID 20360739. ^ "Planet". Oxford Dictionaries. December 2007. Retrieved 22 March 2015. ^ Goldstein, Bernard R. (1997). "Saving the phenomena : the background to Ptolemy's planetary theory". Journal for the History of Astronomy. 28 (1): 1–12. Bibcode:1997JHA....28....1G. ^ Ptolemy; Toomer, G.J. (1998). Ptolemy's Almagest. Princeton University Press. ISBN 978-0-691-00260-6. ^ Leverington, David (2003). Babylon to Voyager and beyond: a history of planetary astronomy. Cambridge University Press. pp. 6–7. ISBN 978-0-521-80840-8. ^ Sider, D. (1973). "Anaxagoras on the Size of the Sun". Classical Philology. 68 (2): 128–129. doi:10.1086/365951. JSTOR 269068. ^ Goldstein, B.R. (1967). "The Arabic Version of Ptolemy's Planetary Hypotheses". Transactions of the American Philosophical Society. 57 (4): 9–12. doi:10.2307/1006040. JSTOR 1006040. ^ "Galileo Galilei (1564–1642)". BBC. Retrieved 22 March 2006. ^ "Sir Isaac Newton (1643–1727)". BBC. Retrieved 22 March 2006. ^ "Herschel Discovers Infrared Light". Cool Cosmos. Archived from the original on 25 February 2012. Retrieved 22 March 2006. ^ a b Thomson, W. (1862). "On the Age of the Sun's Heat". Macmillan's Magazine. 5: 388–393. ^ Stacey, Frank D. (2000). "Kelvin's age of the Earth paradox revisited". Journal of Geophysical Research. 105 (B6): 13155–13158. Bibcode:2000JGR...10513155S. doi:10.1029/2000JB900028. ^ Lockyer, J.N. (1890). "The meteoritic hypothesis; a statement of the results of a spectroscopic inquiry into the origin of cosmical systems". London and New York. Bibcode:1890mhsr.book.....L.
^ Darden, L. (1998). "The Nature of Scientific Inquiry". ^ Hawking, S.W. (2001). The Universe in a Nutshell. Bantam Books. ISBN 978-0-553-80202-3. ^ "Studying the stars, testing relativity: Sir Arthur Eddington". Space Science. European Space Agency. 2005. Retrieved 1 August 2007. ^ Bethe, H.; Critchfield, C. (1938). "On the Formation of Deuterons by Proton Combination". Physical Review. 54 (10): 862. Bibcode:1938PhRv...54Q.862B. doi:10.1103/PhysRev.54.862.2. ^ Bethe, H. (1939). "Energy Production in Stars". Physical Review. 55 (1): 434–456. Bibcode:1939PhRv...55..434B. doi:10.1103/PhysRev.55.434. ^ Burbidge, E.M.; Burbidge, G.R. ; Fowler, W.A. ; Hoyle, F. (1957). "Synthesis of the Elements in Stars". Reviews of Modern Physics. 29 (4): 547–650. Bibcode:1957RvMP...29..547B. doi:10.1103/RevModPhys.29.547. ^ Phillips, T. (2007). "Stereo Eclipse". Science@NASA. NASA. Archived from the original on 10 June 2008. Retrieved 19 June 2008. ^ Wade, M. (2008). "Pioneer 6-7-8-9-E". Encyclopedia Astronautica. Archived from the original on 22 April 2006. Retrieved 22 March 2006. ^ a b Burlaga, L.F. (2001). "Magnetic Fields and plasmas in the inner heliosphere: Helios results". Planetary and Space Science. 49 (14–15): 1619–1627. Bibcode:2001P&SS...49.1619B. doi:10.1016/S0032-0633(01)00098-8. ^ Burkepile, C.J. (1998). "Solar Maximum Mission Overview". Archived from the original on 5 April 2006. Retrieved 22 March 2006. ^ "Result of Re-entry of the Solar X-ray Observatory "Yohkoh" (SOLAR-A) to the Earth's Atmosphere" (Press release). Japan Aerospace Exploration Agency. 2005. Retrieved 22 March 2006. ^ "Mission extensions approved for science missions". ESA Science and Technology. 7 October 2009. Retrieved 16 February 2010. ^ "NASA Successfully Launches a New Eye on the Sun". NASA Press Release Archives. 11 February 2010. Retrieved 16 February 2010. ^ "Sungrazing Comets". LASCO (US Naval Research Laboratory). Retrieved 19 March 2009. ^ JPL/CALTECH (2005). "Ulysses: Primary Mission Results". NASA. Archived from the original on 6 January 2006. Retrieved 22 March 2006. ^ Calaway, M.J.; Stansbery, Eileen K.; Keller, Lindsay P. (2009). "Genesis capturing the Sun: Solar wind irradiation at Lagrange 1". Nuclear Instruments and Methods in Physics Research B. 267 (7): 1101–1108. Bibcode:2009NIMPB.267.1101C. doi:10.1016/j.nimb.2009.01.132. ^ "STEREO Spacecraft & Instruments". NASA Missions. 8 March 2006. Retrieved 30 May 2006. ^ Howard, R.A.; Moses, J.D. ; Socker, D.G. ; Dere, K.P. ; Cook, J.W. (2002). "Sun Earth Connection Coronal and Heliospheric Investigation (SECCHI)". Advances in Space Research. 29 (12): 2017–2026. Bibcode:2008SSRv..136...67H. doi:10.1007/s11214-008-9341-4. ^ Laxman, Srinivas; Rhik Kundu, TNN (9 September 2012). "Aditya 1 launch delayed to 2015–16". The Times of India. Bennett, Coleman & Co. Ltd.
^ White, T.J.; Mainster, M.A. ; Wilson, P.W. ; Tips, J.H. (1971). "Chorioretinal temperature increases from solar observation". Bulletin of Mathematical Biophysics. 33 (1): 1–17. doi:10.1007/BF02476660. ^ Tso, M.O.M. ; La Piana, F.G. (1975). "The Human Fovea After Sungazing". Transactions of the American Academy of Ophthalmology and Otolaryngology. 79 (6): OP788–95. PMID 1209815. ^ Hope-Ross, M.W. ; Mahon, GJ; Gardiner, TA; Archer, DB (1993). "Ultrastructural findings in solar retinopathy". Eye. 7 (4): 29–33. doi:10.1038/eye.1993.7. PMID 8325420. ^ Schatz, H.; Mendelblatt, F. (1973). "Solar Retinopathy from Sun-Gazing Under Influence of LSD". British Journal of Ophthalmology. 57 (4): 270–273. doi:10.1136/bjo.57.4.270. PMC 1214879. PMID 4707624. ^ Chou, B.R. (2005). "Eye Safety During Solar Eclipses". "While environmental exposure to UV radiation is known to contribute to the accelerated aging of the outer layers of the eye and the development of cataracts, the concern over improper viewing of the Sun during an eclipse is for the development of "eclipse blindness" or retinal burns." ^ Ham, W.T. Jr.; Mueller, H.A. ; Sliney, D.H. (1976). "Retinal sensitivity to damage from short wavelength light". Nature. 260 (5547): 153–155. Bibcode:1976Natur.260..153H. doi:10.1038/260153a0. ^ Ham, W.T. Jr.; Mueller, H.A. ; Ruffolo, J.J. Jr.; Guerry, D. III (1980). "Solar Retinopathy as a function of Wavelength: its Significance for Protective Eyewear". In Williams, T.P. ; Baker, B.N. (eds.). The Effects of Constant Light on Visual Processes. Plenum Press. pp. 319–346. ISBN 978-0-306-40328-6. ^ Kardos, T. (2003). Earth science. J.W. Walch. p. 87. ISBN 978-0-8251-4500-1. ^ Macdonald, Lee (2012). "2. Equipment for Observing the Sun". How to Observe the Sun Safely. Patrick Moore's Practical Astronomy Series. New York: Springer Science + Business Media. p. 17. doi:10.1007/978-1-4614-3825-0_2. ISBN 978-1-4614-3824-3. NEVER LOOK DIRECTLY AT THE SUN THROUGH ANY FORM OF OPTICAL EQUIPMENT, EVEN FOR AN INSTANT. A brief glimpse of the Sun through a telescope is enough to cause permanent eye damage, or even blindness. Even looking at the Sun with the naked eye for more than a second or two is not safe. Do not assume that it is safe to look at the Sun through a filter, no matter how dark the filter appears to be. ^ Espenak, Fred (26 April 1996). "Eye Safety During Solar Eclipses". NASA. ^ Haber, Jorg; Magnor, Marcus; Seidel, Hans-Peter (2005). "Physically based Simulation of Twilight Phenomena". ACM Transactions on Graphics. 24 (4): 1353–1373. CiteSeerX 10.1.1.67.2567. doi:10.1145/1095878.1095884. ^ Piggin, I.G. (1972). "Diurnal asymmetries in global radiation". Springer. 20 (1): 41–48. Bibcode:1972AMGBB..20...41P. doi:10.1007/BF02243313. ^ "The Green Flash". BBC. Archived from the original on 16 December 2008. Retrieved 10 August 2008. ^ Barsh, G.S. (2003). "What Controls Variation in Human Skin Color?". PLoS Biology. 1 (1): e7. doi:10.1371/journal.pbio.0000027. PMC 212702. PMID 14551921. ^ Coleman, J.A. ; Davidson, George (2015). The Dictionary of Mythology: An A–Z of Themes, Legends, and Heroes. London: Arcturus Publishing Limited. p. 316. ISBN 978-1-78404-478-7. ^ a b c d e f Black, Jeremy; Green, Anthony (1992). Gods, Demons and Symbols of Ancient Mesopotamia: An Illustrated Dictionary. The British Museum Press. pp. 182–184. ISBN 978-0-7141-1705-8. ^ Teeter, Emily (2011). Religion and Ritual in Ancient Egypt. New York: Cambridge University Press. ISBN 978-0-521-84855-8. ^ Frankfort, Henri (2011). Ancient Egyptian Religion: an Interpretation. Dover Publications. ISBN 978-0-486-41138-5. ^ a b c Dexter, Miriam Robbins (1984). "Proto-Indo-European Sun Maidens and Gods of the Moon". Mankind Quarterly. 25 (1 & 2): 137–144. ^ Mallory, James P.; Adams, Douglas Q., eds. (1997). Encyclopedia of Indo-European Culture. London: Routledge. ISBN 978-1-884964-98-5. (EIEC). ^ Burkert, Walter (1985). Greek Religion. Cambridge: Harvard University Press. p. 120. ISBN 978-0-674-36281-9. ^ Spargo, Emma Jane Marie (1953). The Category of the Aesthetic in the Philosophy of Saint Bonaventure. St. Bonaventure, New York; E. Nauwelaerts, Louvain, Belgium; F. Schöningh, Paderborn, Germany: The Franciscan Institute. p. 86. ^ Owen Chadwick (1998). A History of Christianity. St. Martin's Press. p. 22. ISBN 978-0-312-18723-1. ^ a b Townsend, Richard (1979). State and Cosmos in the Art of Tenochtitlan. Washington, DC: Dumbarton Oaks. p. 66. ^ a b Roberts, Jeremy (2010). Japanese Mythology A To Z (2nd ed.). New York: Chelsea House Publishers. pp. 4–5. ISBN 978-1-60413-435-3. ^ Wheeler, Post (1952). The Sacred Scriptures of the Japanese. New York: Henry Schuman. pp. 393–395. ISBN 978-1-4254-8787-4. Cohen, Richard (2010). Chasing the Sun: the Epic Story of the Star that Gives us Life. Simon & Schuster. ISBN 978-1-4000-6875-3. Thompson, M.J. (2004). "Solar interior: Helioseismology and the Sun's interior". Astronomy & Geophysics. 45 (4): 21–25.